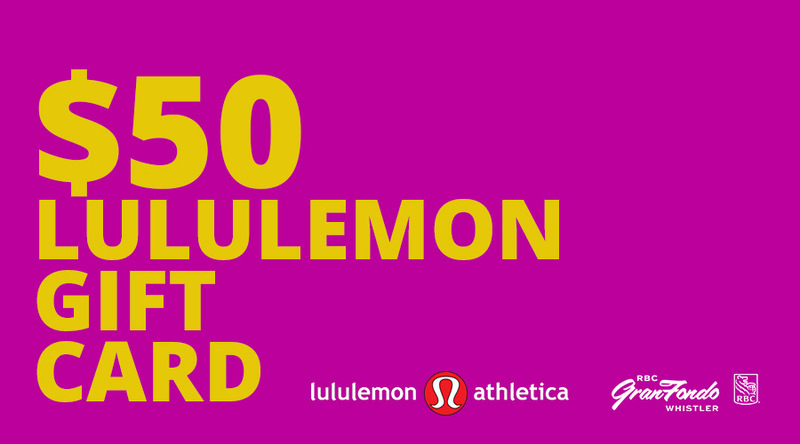 (Link) Register now to get your $50 lululemon gift card! Pow! It’s the 10 year anniversary of RBC GranFondo Whistler in 2019 and we’re celebrating with a series of promotions and specials throughout the year. Our first special was held over the last event weekend, and involved not only the best registration price of the year by far, but also included all registrants in a draw to win 2 places to our signature Italian gourmet weeklong getaway – Bici Gusti Italy. Congratulations to Aaron Shapiro and his partner Katie Daley on winning – we’ll see you in Italy this April! Phase 2 of the celebrations: we’re giving away $50 lululemon gift cards to riders who register for RBC GranFondo Whistler 2019! How do you get your $50 lululemon card? Simply register for RBC GranFondo Whistler 2019 and it will be mailed to you on either the 15th or the 30th of the month while supplies last! Hurry! Less than 150 left. Offer valid from September 25th onwards while supplies last. Keep your eyes peeled for more exciting offers, coming soon. *Gift cards can only be used in and mailed to North, Central and South America. Valid in-store and online.